Every city makes planning and development mistakes in the course of its history. No city is perfect, but a good city will at least try to rectify the err of its urban planning ways. 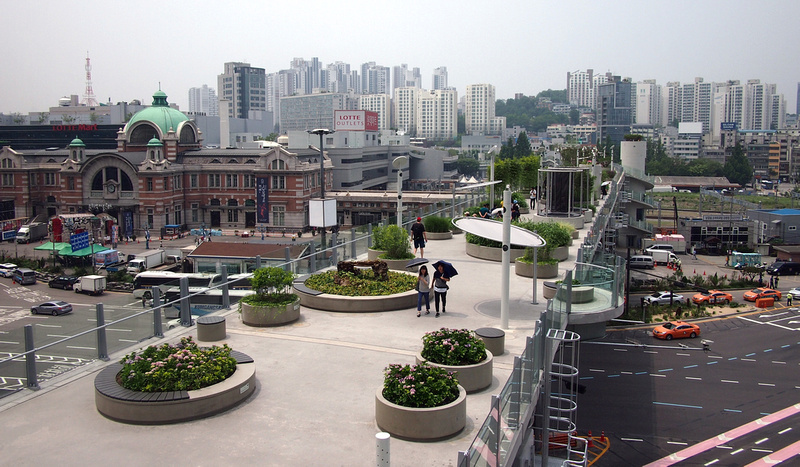 The city of Seoul is a modern city that has razed most of its heritage buildings. The highlight for most visitors to Seoul are the “Five Grand Palaces” built by the Joseon Dynasty over five centuries. 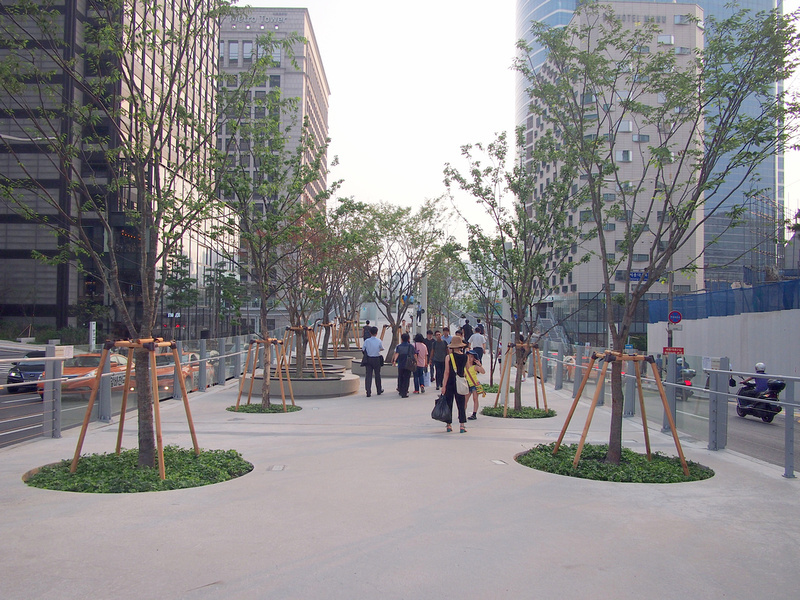 For my visit to Seoul I was most looking forward to seeing two urban regeneration projects. 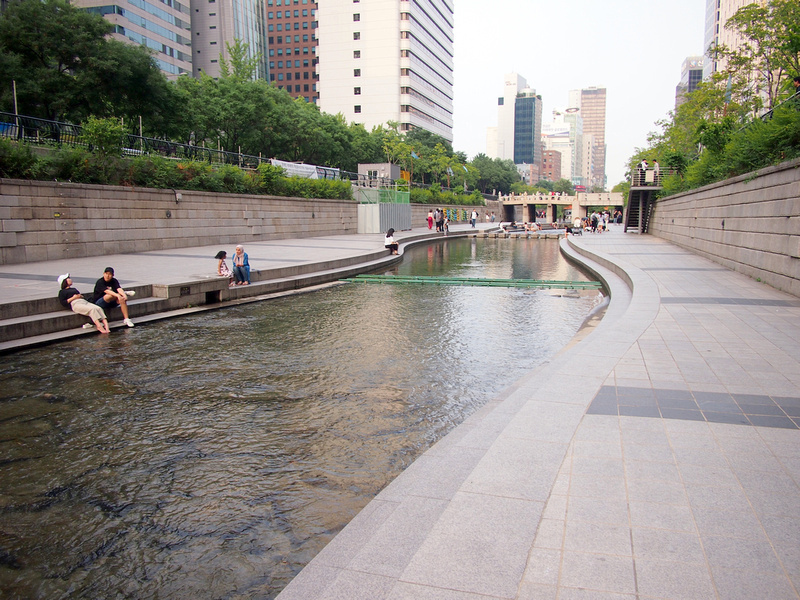 Cheonggyecheon is a stream in central Seoul that was paved over during South Korea’s post-war modernization boom in the 1950’s. 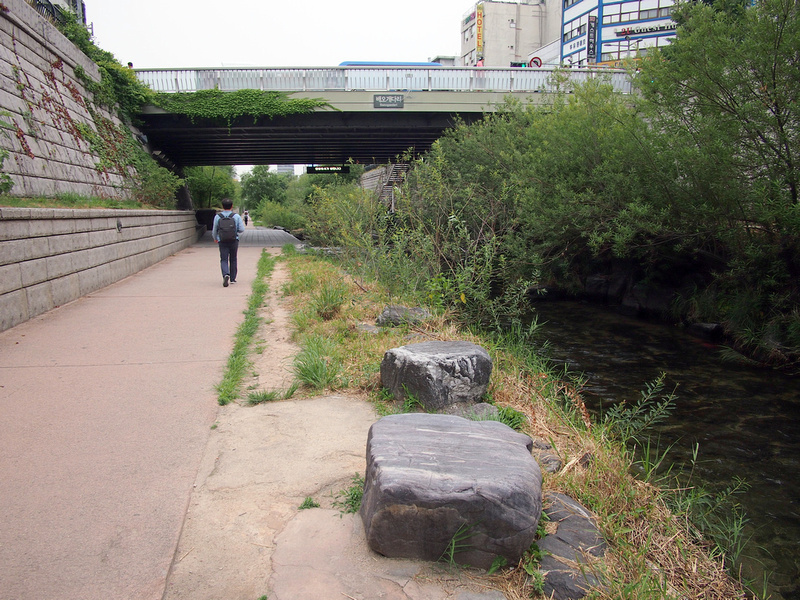 By the 1970’s (a decade with its fair share of urban mistakes) an elevated highway was built along the path of the stream. 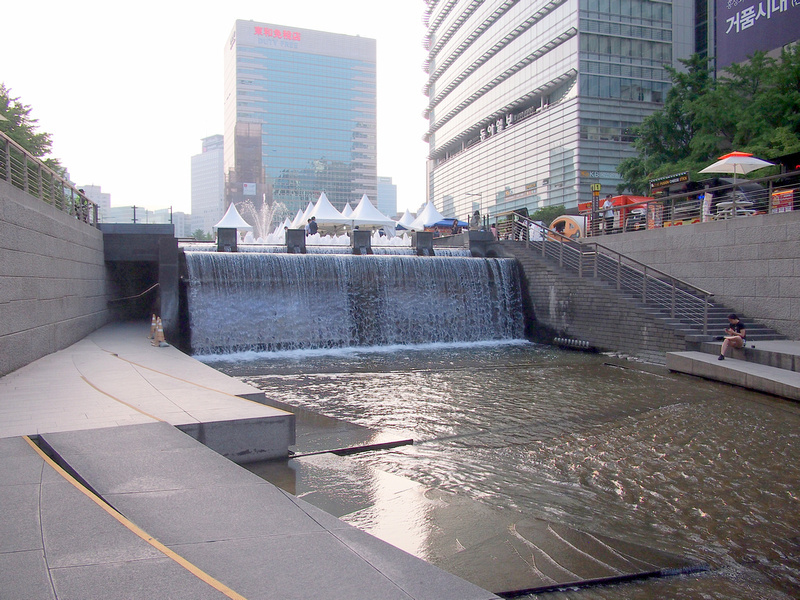 In 2003 the city began the project to remove the elevated highway and to rediscover the waterway buried under concrete. 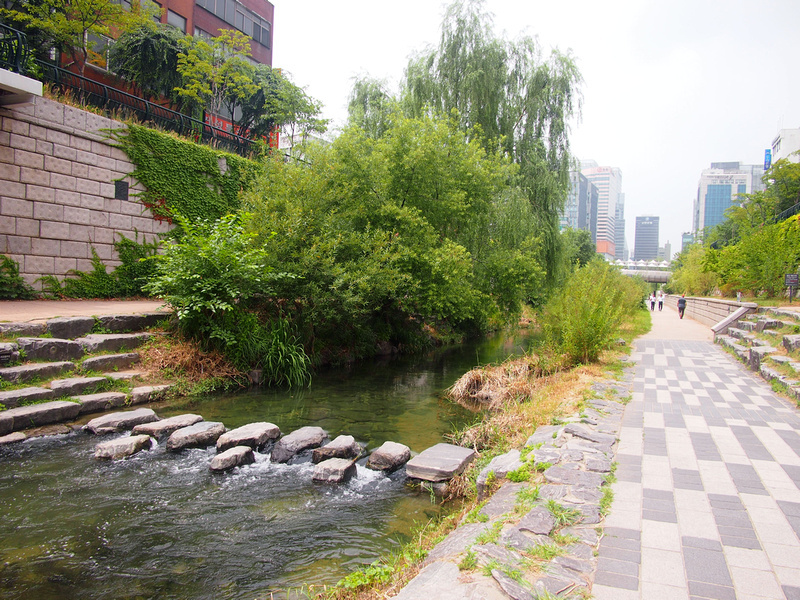 While the stream is not restored to its former natural glory, it has taken on hybrid form of life, blending nature into its new urban environment. 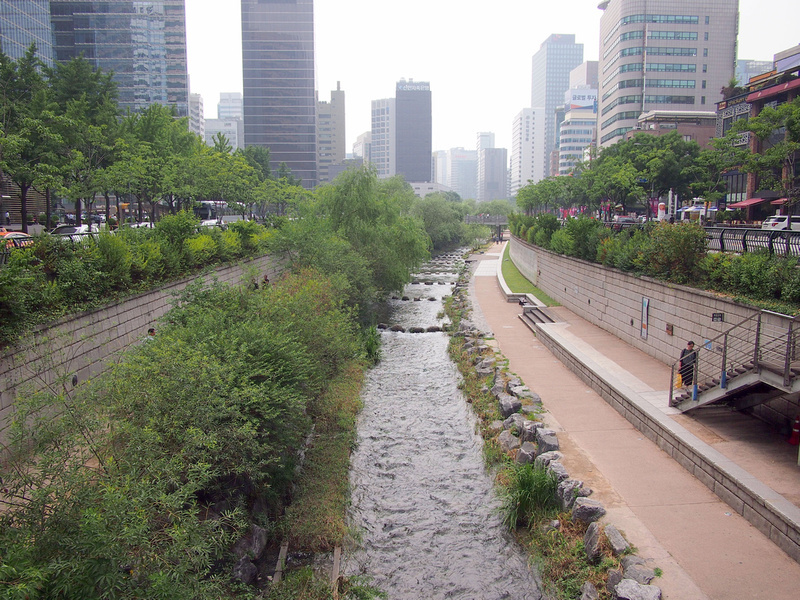 The stream is 11km long sunk below street level. 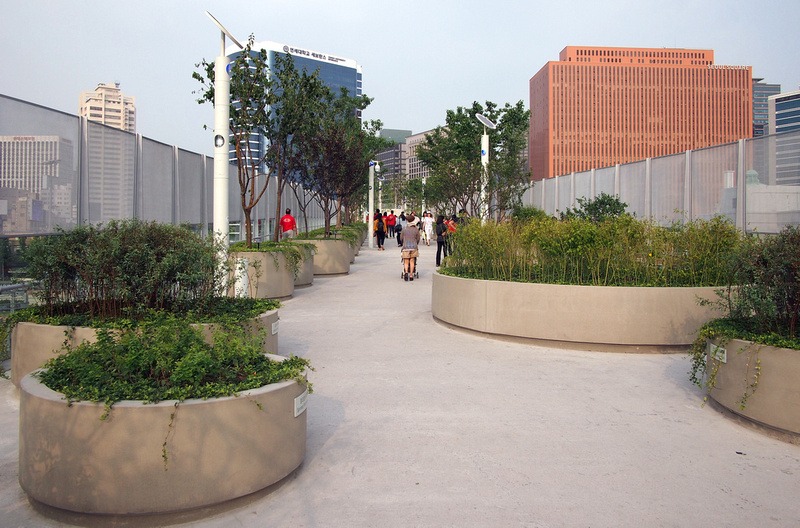 There are walkways on either side with various greenery along the way. The water is so clean that it wouldn’t be out of place in the Swiss Alps. There are plenty of large fish in the water, who live a peaceful life as there is no fishing allowed. The water is pumped from various sources, including groundwater that is collected from the metro system. 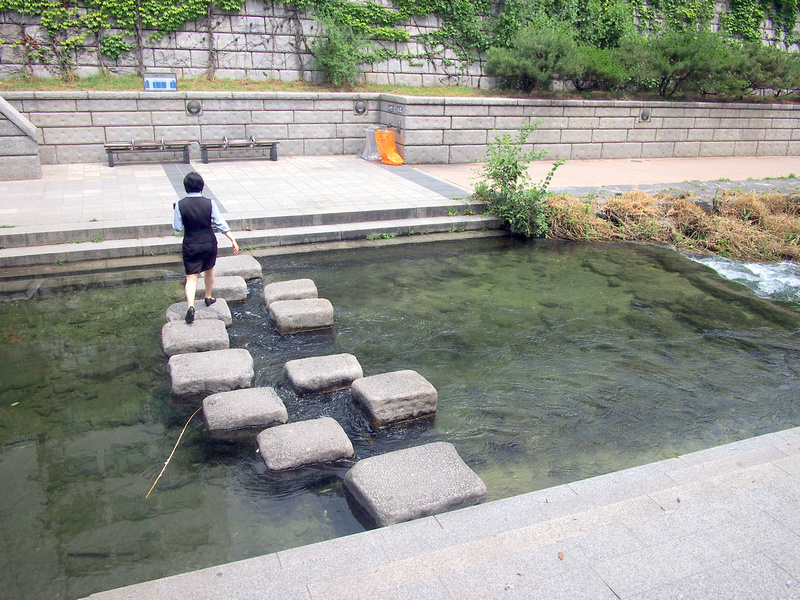 There are stepping-stone crossings along the way which add to the impression that you are at a countryside stream. There are art installations and water features at various points on the stream. At some sections the stream is the embodiment of a concrete jungle. While some sections look closer to its original natural form. The reclamation of this waterway has become a precedent for other cities, with Los Angeles being one city that has considered restoring its concrete river. 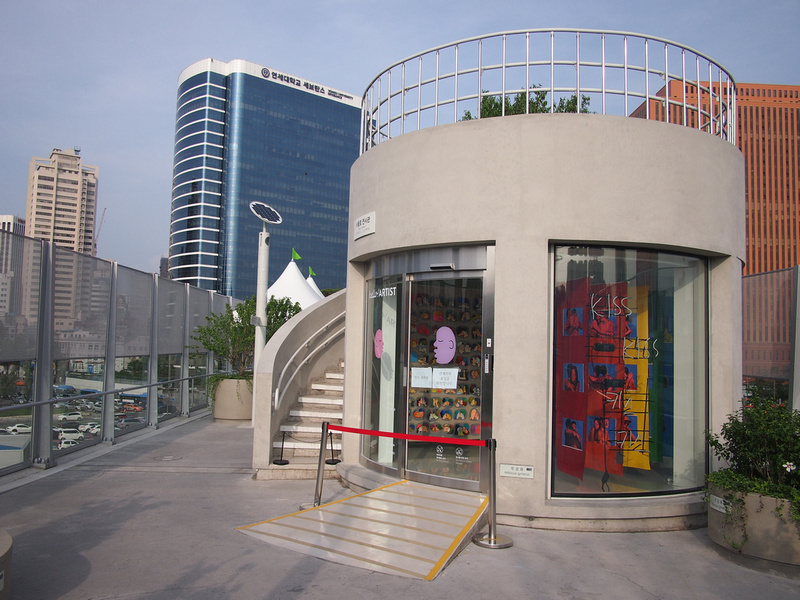 Seoullo 7017 (or Seoul Street) is a pedestrian walkway near Seoul Station that is built on a former elevated highway. 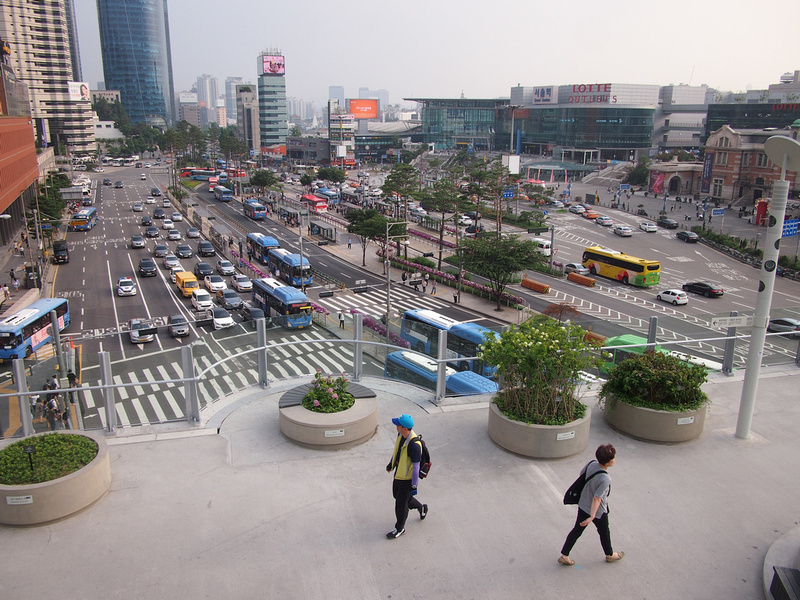 The Seoul Station area is a jumbled mess of roads surrounding the main railway lines. 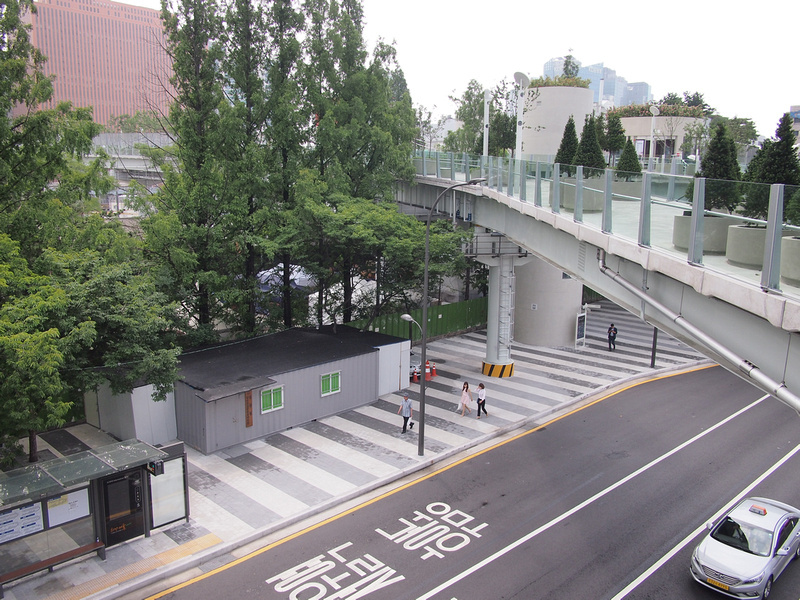 In 1970 an overpass was built to cut across the multiple roads and railway lines in its path, adding to the clutter of road traffic in central Seoul. The overpass was closed in 2015, but instead of being demolished it was proposed to make it into a skypark and pedestrian walk. The idea is modelled on New York’s High Line, which is an old elevated railway line that has been repurposed into a walking path. The path opened in May, 2017 and the name 7017 comes from its original construction date of 1970 and its rebirth in 2017. The path is just over a kilometre long and there is barely any trace that this was once used for cars. The line was just over a month old when I visited so it still had that just-planted feel to it. I noticed how much better the Gardens by the Bay in Singapore looked when the trees had a few years to grow into the park. I suspect once the trees have time to grow it will look more lived in. The walkway is more of a botanical garden than ornamental garden, with a variety of species all marked with their Korean and botanical name. There are some cafes on the path and galleries for temporary exhibitions. There is also a performance space with bands playing in the evening. I was staying at the back entrance side of the railway line, so having this delightful walkway to cross over to the front side was such a pleasant way to go. 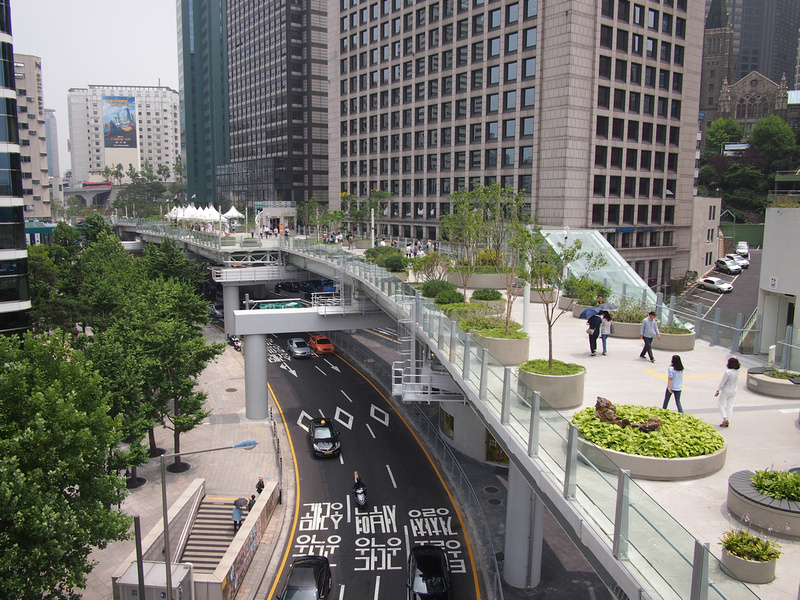 I’m now thinking about other flyovers in cities around the world that would be good candidates for pedestrianisation. Of course one does not simply tear down highways without alternative transport options. Before you start dreaming of tearing down the elevated highway in your home city, you would need a decent metro system to replace it. Seoul has 20 metro lines serving the greater Seoul area, with more expansion plans on the horizon. 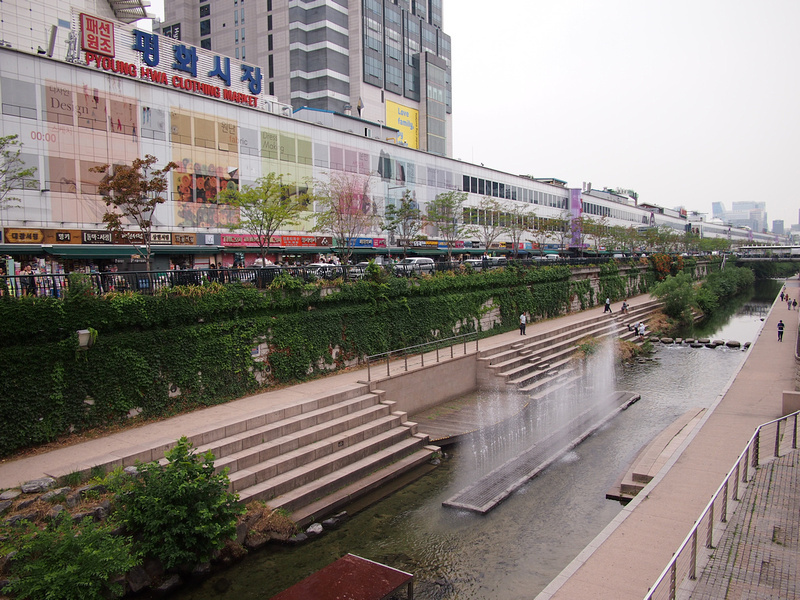 Just as Seoul has “copied” the High Line of New York, I hope other town planners come here and copy the urban regeneration examples of Seoul. wow…!!! such a lovely place, awesome river , amazing roads and bridges , no words for cleanness, thank you for sharing the beautiful pictures. A lot of countries could benefit from learning from Seoul!